Before using the oil presses, first of all should be ready for all of assistant devices and containers, check and adjust the degree of tightness of belts. And then start up the motor so that the machine run empty of material around 15 min, checking the rotate speed of screw pressing worm. The general speed should be around 33 minutes. When purchasing the oil press, first to see the appearance whether welding point is uniform, to check the machine whether lack spare parts, and then to turn the big belt pulley by hand to run several circles in order to check whether there is iron etc. foreign material in press barrel, whether blocked there, at the same time to well note whether gears mesh normally in gear box. Oils that are high with monounsaturated fat will keep up to a year, while refined olive oil, which has the highest of monounsaturated fat, can last a few years. Extra virgin and virgin olive oils will keep about a year after opened. The shelf life of most other oils after opened is usually six-eight months. Do not store oil in that pretty jar in the kitchen window or keep it on the shelf next to the stove. When refers to the topic how to use oil press, we should always read the following words. When empty running, attention should be paid to the meshing condition of gears in gear box and if the voice is normal, if all parts of the bearing and motor run normally. When empty running, the current of motor should be about 3A. If electric current is too high, should stop running the machine immediately to check. Restart the machine after adjustment. When empty running is ok, prepare about 50 kg rapeseed or soybean, ready to put into the feed hopper. Well note that at the beginning of pressing, the feeding of material can not be too fast. Otherwise when the pressure increase suddenly in press barrel, the screw press worm can not run, resulting the block in press barrel, even broken caused serious accident. Thus begin pressing, the feed of material shoulbe be slowly into the hopper so that the oil press run in. So repeated, last more than 3 ~ 4 hours, the temperature gradually increased ready to press, or even smoke (this is a normal phenomenon). At the beginning of pressing, the temperature is lower in press barrel, can move the handle slowly on the worm shaft, to increase the thickness of the meal. While increasing the moisture of material, waiting for the suitable barrel temperature. Rising to 90 ℃, when oil press running normally, change the thickness of cake into 1.5 ~ 2.5 mm, and fastening the fixed nut. After the normal operation of oil presses, for raw material with high oil content, the extraction of oil is mostly concentrated in the rods and forward round rings. The extraction of oil is about 60% in rods, 30% in forward round rings of total oil output. The end extraction is few in drops with light clean color. 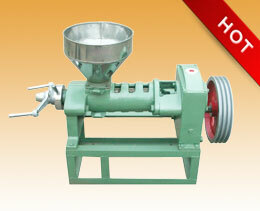 After 2 or 3 times of repeated pressing, the extraction of oil can be out for rapeseed and soybeans. During this period, the oil residue contented high oil can be mixed with material into feeding. The feeding of material need keep evenly, avoid of more or less for a while. Otherwise the life of oil press and oil extraction rate will be affected. When oil press running, should check the output condition of meal regularly. And control the moisture of material neither too high or too low. Normal meal should be flake with smooth on one side close to pressing screw worm and rough veins on the other side. If the meal is too loose, out of shape, dark color and easy broken by hand, that is too little water added into material caused. If the meal is soft, big flake, and too much foam in extracted oil, that is too much water caused. Under normal conditions, there is no or little residue out from round rings. The residue is out from rods. If the residue is like thin flakes, it means moisture is too high. If the residue is like powder, it means moisture is too low. Moreover, the position of oil extraction can show if the moisture of material suitable for pressing. The moisture of material for pressing too high or low, the position of oil extraciton will move backward.